When studying the Cold War, one cannot help feeling overwhelmed by the amount of acronyms used by both the US and the USSR. From NATO and ICBMS (Inter Continental Ballistic Missiles) to SALT (Strategic Arms Limitation Treaty) and VOA (Voice of America), acronyms seem to have played a major role in this prolonged global conflict. Yet if there is one acronym that best captures the terrifying Cold War mentality it is MAD or Mutually Assured Destruction, a military doctrine according to which use of nuclear weapons would lead to the annihilation of both the attacker and the defender. Nowadays, Russia and the US find themselves at the opposite sides of another global conflict revolving the future of Eastern Ukraine. Over the past weeks, both Russia and the US have adopted a Cold War like rhetoric. In his recent State of the Union Address, President Obama stated that his new policy towards Cuba could end a legacy of “mistrust in our hemisphere”. 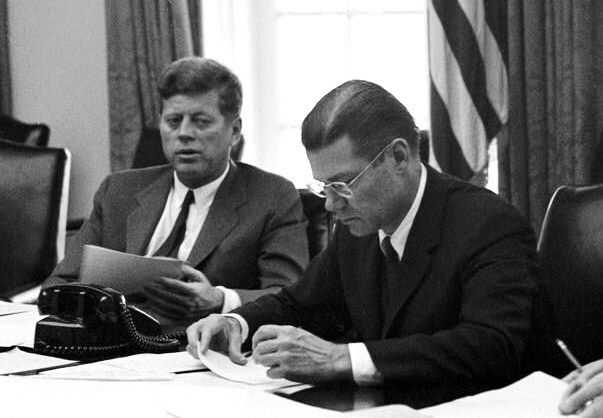 The last time a US President spoke in such terms about Cuba was when President Kennedy addressed the American people at the height of the 1962 Cuban missile crisis. According to Russian Foreign Minister Sergey Lavrov, NATO has chosen a confrontational approach towards Russia as it still “thinks in Cold War categories”. In November of 2014, Russia even re-launched Sputnik, a Cold War icon, in the form of an international news service. So while much has changed since the end of the Cold War, some of its language still applies today. Such is the case with the MAD acronym, which currently spells out Mutually Assured Delegitimization. Given that both the US and Russia have established a formidable online presence, it is not surprising that much of the current information war between the two sides is taking place on digital diplomacy channels. Over the past year, both the State Department and the Russian MFA have used digital diplomacy in order to offer their interpretation of events in the Ukraine and attack one another. What characterizes such attacks is that they revolve around moral issues. Both countries have gone to great length to exhibit their own morality on SNS, while questioning that of the other’s. Essentially, both sides use social media as a tool for moral delegitimization. Morality is of relevance to international relations as it lends legitimacy to the use of hard power. As Joseph Nye suggests, if a nation’s power is seen as legitimate, it will encounter less resistance to its actions in the global arena. Thus, moral delegitimization on digital diplomacy channels may be viewed as an attempt by nations to deplete an adversary’s soft and hard power resources. Morality is also a key component in a nation’s global image. Moral delegitimization may therefore constitute an attempt to tarnish an opponent’s global image thereby reducing the efficacy of his public diplomacy efforts. In this post, I offer an analysis of the manner in which Russia and the US exhibit their own morality and call into question that of the other’s. By examining all tweets published by the Russian MFA and the US State Department over the past five weeks, I have been able to detect certain themes into which tweets dealing with morality may be clustered. Russia’s moral self-portrayal seems to revolve around three themes the first of which is its involvement in resolving global conflicts. Over the past month, Russia has hosted talks between rival Syrian factions in an attempt to end the nation’s horrid civil war; it has expressed its concern regarding the lack of progress in the Middle East peace process and its support of UN Security Council involvement in this process as well as focusing on its role in ridding Syria of chemical weapons. Finally, in a tweet from January 21st, Russia underlined its contribution to the resolving of the Iranian nuclear crisis. Through such tweets, Russia presents itself as the solution to global conflicts rather than its cause. The second theme detected in Russian tweets dealing with moral issues was its humanitarian efforts. In a long series of tweets, Russia’s MFA detailed the country’s financial aid to combating the Ebola outbreak as well as humanitarian aid to Eastern Ukraine. The third theme contains tweets dealing with Russia’s historic opposition to fascism and Nazism. Such tweets not only deal with Russia’s role in winning World War Two but also with its commitment to remembering the lessons of the past. In a tweet from the 21st of January, Russia stated that the “vaccine against Nazism” is losing its effect in some countries. This may be a reference to Ukraine as Russia has previously stated that the cause of the Crimean crisis was a coup d’état in Kiev perpetrated by Neo Nazis and Ultra-nationalists. It is in the context of World War Two that Russia also attacks US morality. For instance, in the following tweet Russia depicts the US as immoral given its refusal to support a UN resolution combating the glorification of Nazism. Two tweets, one published on January 21st, and the second on the 16th of January, dealt with immoral aspects of the US war on terror. The first focused on alleged CIA torture of terror suspects and the second on a Russian detainee held in the Guantanamo Bay detention center. Finally, while Russia portrays itself as the solution to global conflicts, it portrays the US as the cause of such conflicts. In a long series of tweets, Russia stated that US refusal to engage in dialogue is the root cause of the Ukrainian conflict. US unilateral actions, such as economic sanctions on Russia, are portrayed as a menace to global peace as they compromise Russia’s commitment to the Strategic Arms Reduction Treaty. By following a Cold War mentality, the US is portrayed as undoing the progress made since the end of that war. During January, the US State Department made only a few references to Russia. Yet what is interesting is that the US portrayed Russia as its mirror-state. If the US stands for something, Russia stands fort the opposite. For instance, over the past month the US has reaffirmed its global commitment to freedom of speech and the security of journalist as demonstrated in the tweets below. While the US portrays itself as a global promoter of free speech, Russia is presented as it oppressor as is the case in the tweet below dealing with a Russian backed raid on a Crimean television channel. Russian masked raid on Crimean Tatar TV channel ATR shameful. Add this to the list of offenses in occupied Crimea. Another theme in America’s moral self-portrayal is its leadership in the struggle for human freedom. During January, tweets published by the US State Department dealt with the issues of human trafficking and modern slavery as seen below. Finally, US morality was demonstrated by the State Department in tweets dealing with American support of women’s rights and freedom as shown below. How to mark Zero Tolerance Day for FGM/C: Post a photo of yourself or with a friend holding up a zero sign. Use #TogetherForZero #endFGM. As opposed to the US, Russia’s immorality is manifest in its incarceration of a women hostage, former Ukrainian solider Nadiya Viktorivna Savchenko. In summary, the Mutually Assured Destruction doctrine was one of a balance of power, or horror, between the US and the USSR. The question is if the current doctrine of Mutually Assured Delegitimization is not as destructive as each nation undermines the other’s moral standing and in the process tarnishes the other’s global image to a similar extent. Posted in Uncategorized and tagged Cold War, Digital Diplomacy, Nation Branding, Public Diplomacy, Russia, Twitter, US. Bookmark the permalink.